Our Getaway Cruise is a great way to get your weekend started! During this two hour cruise we offer live entertainment, a full bar of delicious beverages and our Wheel House Grille offers a variety of meal selections for purchase. 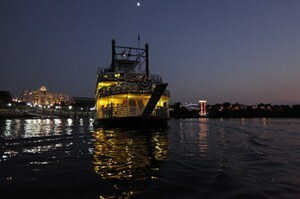 Come watch the sunset on the Alabama River aboard the Harriott II Riverboat! Don't miss the boat! Inside General Admission seating is located inside one of our two climate controlled decks, Outside Patio seating is located on the outside top deck and is first come first serve seating. Patio seating is not handicap accessible. Please purchase boarding tickets before purchasing an Add-On Package. Cruises rain or shine. No refund or exchanges.